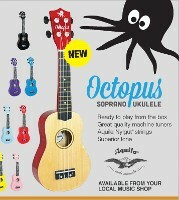 Please find below our currently available instrument list. You can be assured that both used and new instruments are all fully checked and setup before dispatch. 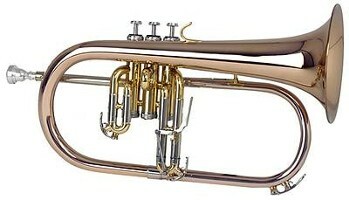 DUE TO DAILY SIGNIFICANT VARIATIONS IN THE WORLD EXCHANGE RATES, THE PRICES ON NEW INSTRUMENTS ARE SUBJECT TO CHANGE. WE WILL ENDEAVOUR TO KEEP THE WEBSITE UP TO DATE, BUT THIS IS NOT ALWAYS POSSIBLE.THEREFORE,WE RESERVE THE RIGHT TO ALTER THESE WITHOUT PRIOR NOTICE. WE WILL OF COURSE INFORM YOU OF ANY PRICE CHANGES IF YOU PLACE AN ORDER, BUT PLEASE FEEL FREE TO TELEPHONE TO CONFIRM PRICES. 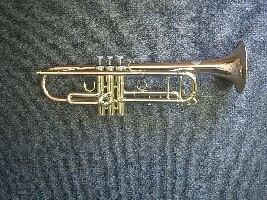 This must be the best value for money student cornet on the market. 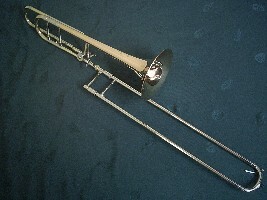 It is similar in design to the Yamaha Xeno. Bore size 11.68 mm (.462 ins) Bell size 125mm (4.92 ins) 1st & 3rd Slide Triggers, Monel valves, Nickel Silver slide legs. 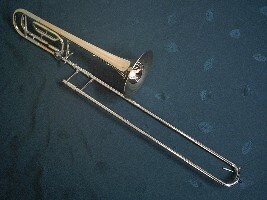 An easy blowing instrument with good tuning qualities.Silver plated. Supplied in deluxe case with back pack straps. 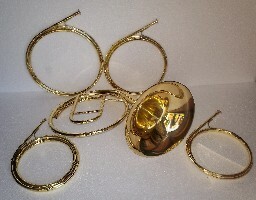 Gold brass bell and leadpipe, ML bore , Monel valves ,1st and 3rd valve fixed finger rings. 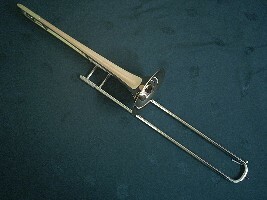 Complete with mouthpiece and deluxe case. An intermediate model , recommended for the advancing student. 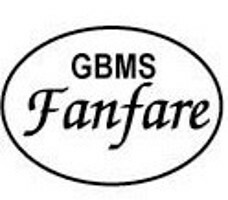 Our Fanfare range of instruments are built in China.They may not be the cheapest, but we consider them to the best. We don't buy directly from China, but from a German manufacturing company who made significant contributions towards the design and make regular trips to China to oversee the manufacturing and keep an eye on the quality control. We are so confident about the quality that each outfit comes with a full 2 year guarantee. BUY WITH COMPLETE CONFIDENCE. See the letter in News and Reviews from one of our delighted customers. 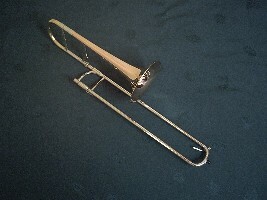 Peter Gane Eb Alto Trombone Bore 12.2mm (.480) Red Brass Bell 180mm (7"). Chrome Plated Nickel Silver Inside Slides. Nickel Silver Outside Slides. Sturdy, Lightweight Case with Backpack Straps. GBMS 'Halstead' HAND-HORN An inexpensive 'entry level' hand horn for those players who wish to develop hand technique skills without paying several thousands of pounds for a high-end instrument such as a Seraphinoff (USA) or a Jungwirth (Austria). I always used to recommend the John Webb 'Bohemian' or 'French' models as a matter of course. 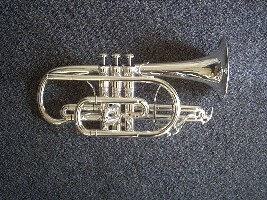 However, new Webb horns are no longer available, owing to the sad death of Mr Webb in 2014; consequently 2nd-hand examples are rare, commanding high prices. 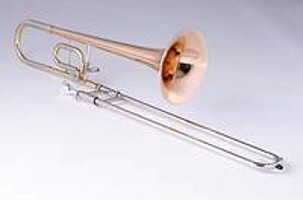 If you simply don’t have that kind of money, this very attractive lacquered yellow-brass French reproduction hand horn is ideal as a ‘starter’, and is immediately available. 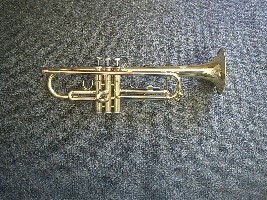 It has a very narrow bell throat, so that small movements of the right hand have a big effect on the pitch. Supplied with four crooks, D, E flat, E and F, playing at pitches between A 440 and A 435, supplied in a padded case with detachable pockets for each crook, this has got to be the ultimate 'hand horn bargain'.